Bigfoot News | Bigfoot Lunch Club: IS BIGFOOT MY BROTHER'S KEEPER? Wow, BF Researcher Epic Gilgamesh, you sure have set the blogging bar high for this club. My interest has been peaked. There sure are all sorts of theories out there and I can't wait to explore them. Thanks for the post, keep up the good work. btw - nowhere in the Bible does it state that Cain and Abel were Adam and Eve’s first children, and several scriptural and pseudopygriphal documents specifically state that they weren’t. Just FYI…. Actually, the Bible states in Genesis 4:15 "And the Lord set a mark upon Cain, lest any finding him should kill him." The mark was put on him so that he would NOT be slain. Any that did so, as the Bible puts it, "vengeance shall be taken on him sevenfold." 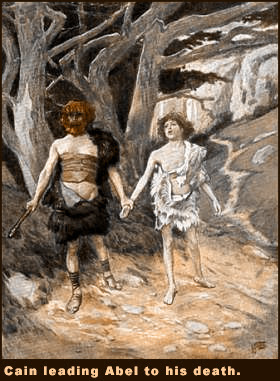 According to Genesis, Cain's punishment for murdering his brother Abel was that he was "cursed from the earth" and that "when thou tillest the ground , it shall not henceforth yield unto thee her strength; a fugitive and a vagabond shalt thou be in the earth." So are Cain and his descendents Bigfoot, well, only God knows. It is as good as any other theory out there at present. Only a fool would be too quick to judge one way or another. As a member of the Church, I have heard this story since I was a kid. Interestingly enough, when I learned Dr Medlrum was LDS the first thing I wondered was what he thought about the story. From his comment, it doesn't sound like he puts too much weight in the thought that Cain is Sasquatch. Most Mormons have never read the actual account, even saying it was Bringham Young who ran into him (Cain). Trust me, the Mormons have just as many crazy stories based on heresay as the Catholics! And the Catholics down here on the border make this story as plausible as saying the sun rose today! Maybe the guy did see Cain. I've heard wilder stories by elected officials. Do I buy into it? I take the old guy by his word, but in no way do I think it was a Sasquatch, or some mystical Indian shift changing wolf sprit. Just, (as you would imagine a guy who's been around since day one and killed his brother from sacrifice envy), a grumpy hairy stinky guy who can't die. Come on! Haven't you seen The Highlander or Hanckock? $hit would get old after awhile! Oh, and just because I'm LDS doesnt mean that I want more wives, wish smoking stinky weed was against the rules, or finds Utah a comfortable state to visit. In the end, just take this story for what it is. An old overly religious guy hopped up on talks of Jesus and which wife he was going to shag that night, and making sense of things that make no sense. David Patten was a member of the Quorum of the Twelve and one of this first martyrs for the gospel of Jesus Christ in this dispensation. Although your writing is witty, I don't know if I would talk about him in that context and tone. I have been reading about him recently more than I have before, and it just made me uncomfortable is all. Thanks! Those interested in learning more about the Church of Jesus Christ of Latter-day Saints, and the actual doctrines of the church should visit www.mormon.org. At first glance, they might not seem near as fun as Bigfoot folklore :), but they will bring lasting satisfaction and answer great questions of the soul.